Identifying the writer is made easier by his stated relationship to the recipient as mother. Murray Millard is the son of Charles K. and Elizabeth Millard of Oakfield, Genessee County, NY. 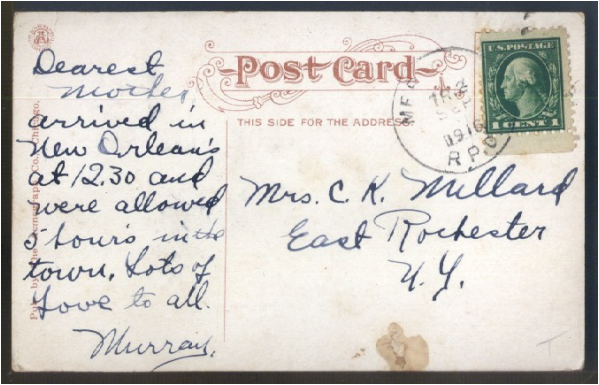 When Murray wrote the postcard in 1916, he was a young man of 28. He had been a soldier from March 28, 1908, when he enlisted in Company F of the Army Engineers in Ohio, until March 27, 1911 when he was discharged in Washington State. In the records he is described as 5' 5" with dark brown hair; he was born in Mumford near Rochester, NY about February 1887. He re-enlisted immediately for another tour of duty which ended March 27, 1914 in Vancouver, WA. Those records described him at 5' 5.5", blue eyes and dark brown hair. The census of 1900 shows that Charles [47, b. Jan 1853] was a blacksmith, with a family consisting of his wife Elizabeth [37, b. June 1862], son Murray N. [12, b. Apr 1888], daughter Marjorie G. [8, b. Oct 1891], and son Lee [2, b. Dec 1895]. Oakfield is a small town about midway between Rochester and Buffalo. Its population now is 1800, and may not have changed much since 1900. Charles rented his house, which meant that he was probably not all that prosperous, but on the other hand, had an occupation that would allow him to move to virtually anywhere he wanted. He and Elizabeth had been married 12 years, Elizabeth was the mother of 5 children, 4 still living, so Murray had a brother or sister die while still a child. Everyone in the family was born in New York of parents born in New York. Murray and Marjorie were in school in 1900. By 1910 the family lived at 358 West Ferry Street in Buffalo, NY consisted of Charles K. (56), Lizzie I. (46), and Lee W (14). Murray and Marjorie were not listed, but at 22 and 18, were probably on their own. Lizzie was the mother of 5 children, 4 still living at that time. The census shows that the marriage between Charles and Lizzie was a second marriage for both. Charles, still a renter, was listed as a driver for a grocery wagon. They have not been found in 1920, but by 1930 Charles and Lizzie were living in East Rochester with two lodgers. What Murray was doing in New Orleans in 1916 cannot be ascertained from available records. He is not found on the WWI draft registration database conducted in 1917 for service in the war, possibly because he had already served his duty. Nor does he appear on subsequent census or other records, so he may have died young. By 1930 Charles and Lizzie were living in East Rochester with two lodgers. Charles Millard, head of household, Year: 1900; Census Place: Oakfield, Genesee, New York; Roll: 1038; Page: 6A; Enumeration District: 14; FHL microfilm: 1241038. Charles K. Millard, head of household, Year: 1910; Census Place: Buffalo Ward 20, Erie, New York; Roll: T624_947; Page: 17B; Enumeration District: 0194; Image: 74; FHL microfilm: 1374960. Murray M. Millard, enlistee, U.S. Army, Register of Enlistments, 1798-1914 [database on-line]. Provo, UT, USA: Ancestry.com Operations Inc, 2007. Charles K. Millard, head of household, Year: 1930; Census Place: East Rochester, Monroe, New York; Roll: 1447; Page: 23B; Enumeration District: 243; Image: 1013.0; FHL microfilm: 2341182.
remained a stable focus as surrounding buildings underwent facelifts or replacement throughout a century of urban development. Currently, the first floor is Mia Bella Trattoria Restaurant, a fine Italian restaurant I once shared a dinner with an opera tenor in town for [performance].